Cushion: 4" High Density Foam with 1" polyester fiber wrap. Cushion Fabric: Sunbrella Canvas Outdoor Upholstery. Free shipping within the continental US. Installation by customer, hired contractor, or arborist. Detailed assembly video included. Assembly takes 1-2 people about 1 hour. (excluding anchor point installation) Consult with a contractor or arborist if unsure about hanging anchor support. 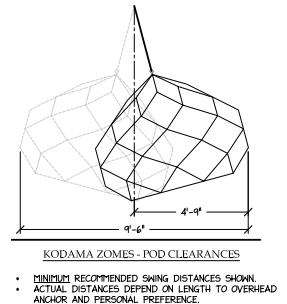 We understand that there can be many questions about the zome and the best type of installation. Our experienced sales team and technical support is here to help you or your contractor with everything needed for your zome. 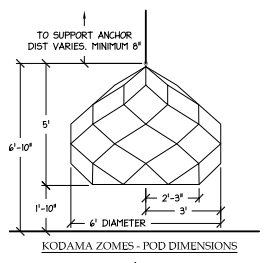 Let us assemble a Zome Hanging Kit specific for your house, tree, trellis or gazebo. We can also work with your designer/contractor to help integrate the zome into your remodel or outdoor landscaping decor. Contact our sales team for volume orders and trade services. We provide customization and COM fabric options for hospitality and resort applications. 4" High Density Foam with 1" polyester fiber wrap.